View More In Facial Steamers. USB charging and no need for battery. 30 ML water tank can be used for more than 20 minutes with large amount of mist. Nano Ultrasonic technology splits water molecules into tiny nanometer particles to make the effective component penetrate into the depth of skin by atomization processing. It can relieve dryness due to air conditioned, heated or cooled environment. It is perfect to be used with diluted facial toner and 10x more effective than facial mask. Also it can provide the necessary humidity to help you set and refresh your make- up. The sprayers can be placed in lady makeup bag or wallet easily with light weight and mini- design. You can have a facial sauna at home, in the office, dating, shopping or outdoor parts anywhere you like. Do not use lotion, milk, honey or highly viscous essential oil. Recommend, fill with distilled water or clean pure water. Clean the water tank regularly, keep the USB cable dry. 1.Unscrew the water container on the top. 2.Inject liquid into it . 3.Tighten the liquid container back, gently shake the device for several times. 4.Slid down the spray switch to turn on the spray function. 5.It will start producing spray. 6.Keep 20 - 30 cm away from your face and go around the face in U shape to apply mist evenly on the face. Very convienient:Design mini, which fits for your handbag or pocket. Enjoy facial sauna at office, on flights, outdoor, at dressing room and so on. Easy to use:1 minute automatic shutdown for convenience. USB rechargeable design can be connected to the computer or phone adapter for charging, no battery required. 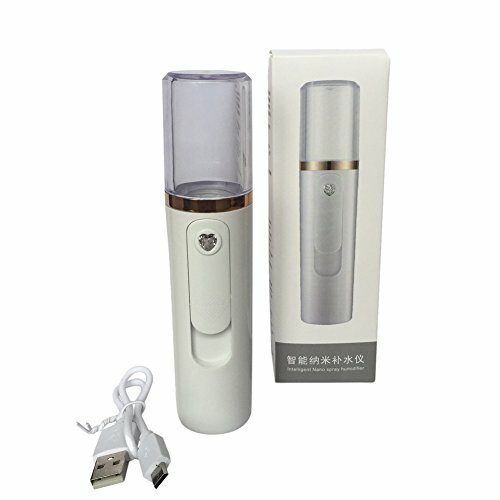 Special design:It is an ideal gift, enjoy the freshness,relieve fatigue and makes skin firmer. If you have any questions about this product by Yiitay, contact us by completing and submitting the form below. If you are looking for a specif part number, please include it with your message.